Our Natural Swiss Formula Anti-Aging Retinoid Face Oil features a combination of Blue Tansy Oil, Chamomile, Grapeseed Oil, enriched with potent ingredients to reduce the signs of aging. Our Retinoid Face Oil works during the night so you can have a more youthful and glowing skin in the morning. Hydroxypinacolone Retinoate ester (retinoid) is proven to increase blood flow in skin with the ability to reduce wrinkles, fight acne, increase cellular turnover, boost collagen and even skin tone. We then balance the formula with blue tansy and chamomile, giving a rich soothing blue azulene so the look of redness and sensitivity are balanced for a calm even-toned complexion. It is specifically formulated to restore your skin to its natural state of beauty. 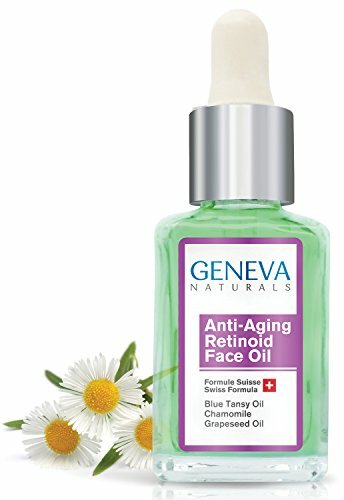 NATURAL SWISS FORMULA – Geneva Naturals uses a proprietary Swiss Formula that stimulates cell regeneration and defends the skin from free radicals while diminishing fine lines and wrinkles. SWISS DERMATOLOGIST APPROVED – All Geneva Naturals skincare products have been thoroughly tested and approved by leading Swiss Dermatologists. HIGHEST QUALITY – We use the highest quality Seed Oils available in our formula. Perfect for anyone serious about taking care of their skin! We are proudly paraben-free, sulfate-free, phthalate-free & cruelty free.